Excel holds a special place in the hearts of IT finance professionals – it’s comfortable, familiar, and has a refined set of core capabilities. But therein lies the problem, the core capabilities of Excel simply don’t extend to accommodate the rigors of today’s IT financial management task load. As data sets grow larger and complexity of analyses increases, the practical utility of Excel we know and love quickly evaporates. And once you cross that threshold, things get messy… fast. A seemingly logical system based in Excel can and will eventually morph into a rat’s nest of spreadsheets hobbling your IT organization’s efficacy within the business – hindering tracking, reporting, forecasting, and every other function necessary to effectively manage IT spend. Meanwhile, these issues coalesce into a major blockade against the transparency needed to maintain IT’s respected seat at the corporate table. The traditional spreadsheet approach is a zero-sum game. Ultimately, the job becomes more about wrangling data than gleaning insights. Whether you’re already living in “spreadsheet hell,” or you’re just beginning to see your organization go down that path, there are 4 simple steps you can take right now to start diagnosing and curing the problem. 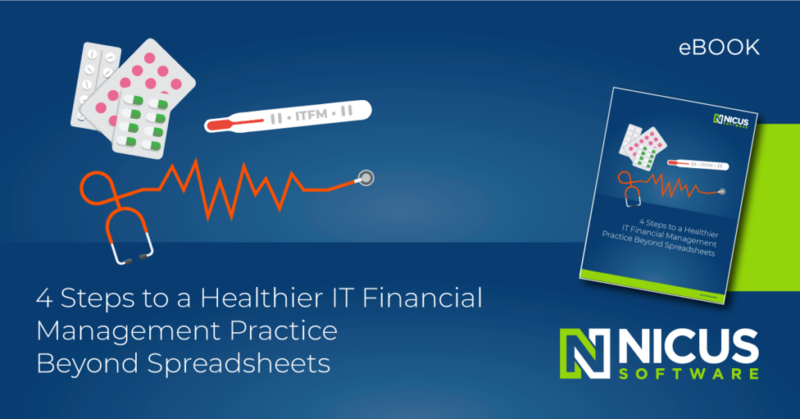 Download this eBook for a step-by-step guide addressing the ITFM ailments the traditional spreadsheet approach is causing within your IT organization, and to see what’s possible once you eliminate them. When was your last ITFM check-up? Look within your ITFM practice and organization to recognize common symptoms of the spreadsheet approach. BE HONEST. Denying symptoms will only negatively impact the health of your ITFM practice. The manual nature of working within spreadsheets means that errors are easy to make, which prohibits true data integrity. If you can’t count on data to be accurate, there’s little hope of effectively managing IT finances. Errors have far-reaching consequences on ITFM, not the least of which is your credibility. At first glance, a spreadsheet solution might seem inexpensive – nearly free. However, consider the amount of time spent manually gathering and inputting data, verifying its accuracy, adding formulas, manipulating formats for different audiences and distributing reports. Add to this the price of errors and delayed decisions that result from time-consuming data gathering processes, and the cost of this method rises significantly. The manual nature of spreadsheets brings about many issues, not the least of which is a lack of automated workflows. Spreadsheets passed via email – or worse paper – diminish any hope of efficient workflows or automated processes.